Lot Detail - 1910 E98 "Set of 30" Ty Cobb, Red – PSA GEM MT 10 "1 of 2!" 1910 E98 "Set of 30" Ty Cobb, Red – PSA GEM MT 10 "1 of 2!" Graded GEM MT 10 by PSA. Hall of Famer. This is one of just two examples at its tier among a total of fourteen copies recorded in PSA's census reporting. 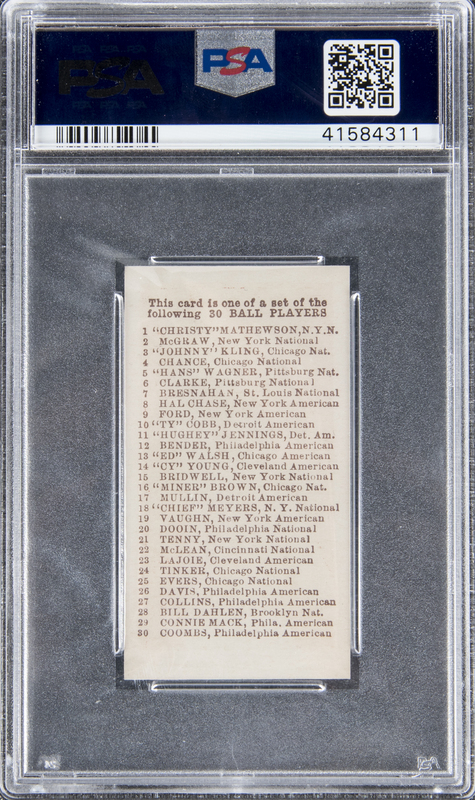 "E"-cards from this series, made by an anonymous national producer to accompany candy, are highly prized, period collectibles that appear as long-standing entries on even the most advanced wantlists. "PSA GEM MT 10" ... just like that, a simple statement, right? On the surface, yes, but the concept within carries implicit impact that's significant almost beyond measure. That straightforward declaration of flawlessness, in a candy card that's more than a century old, no less, could legitimately be accompanied by the powers-that-be grabbing the industry's collective shoulders and shaking them hard, while whispering into its ear – in the manner appropriated by parents for use on recalcitrant children – Do you realize how important this is?! Imagine the continuum of an E98's eleven-decade sail to reach the shores of our time. Once as prevalent as the Passenger Pigeon and T59 "Flags of the World" (the former now extinct, the latter endangered without fanfare) the one-time profusion of E-cards has been thinned relentlessly, innocently. How many fell through the boards of the General Store's porch as patrons opened their packs of caramels? How many succumbed to the effects of travel in pants-pockets, or were unceremoniously glued into scrapbooks? Even if great-great-granddad took good care of his cards, look what happened when they landed in the late Seventies. Cards are worth money! Dig 'em out! They were rubber-banded into wads, packed into primitive sleeves, or – worse, yet – crammed into those old plastic pages that smelled just like the little inflatable backyard swimming pools used by many youngsters. Volumes could be written – and jeremiads extended for hours – about the perils inherent in E-cards' navigation through the ages. Hopefully and fortunately, at last, we can assume that safe harbor has been reached by the beloved collectibles. And here we have a most glorious survivor: a "10." In spite of all that it could have been through, and the many times the earth has spun since the card's emergence, it retains its grasp on sheer perfection. 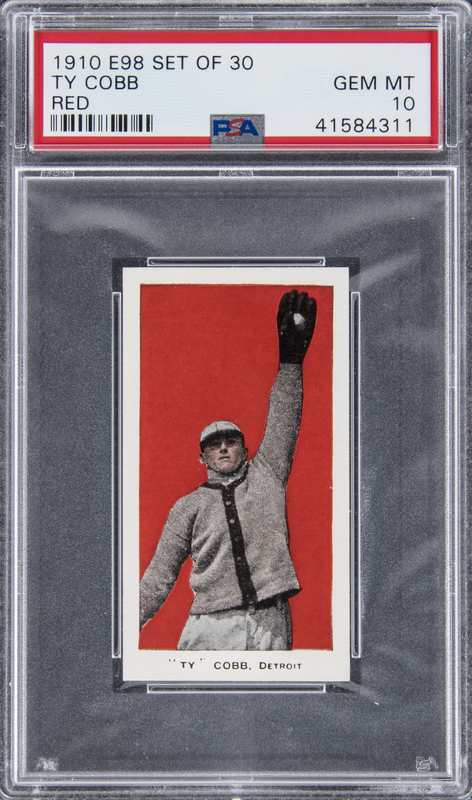 This exceptionally rare and delicate card, picturing Ty Cobb, depicts the legendary hitter in a tinted black-and-white photograph set against a blazing red background. Here, Cobb's likeness is refined and preserved beyond the point that would enable the average vocabulary's powers of descriptive articulation to summarize its splendor. The card's obverse presentation is luscious and intense. Its border framework is impeccable, its cardback's printing sublime, its corners accomplished with unspeakable precision. The card's very existence defies the laws of probability, and the number of its type revealing equivalent visual plenitude (10 specimens in total, actually ... barely one-half of one percent, from more than 1,700 E98 "Set of 30" cards resting in PSA holders) is minimal, indeed. Here's an unbelievably sanguine artifact – and a gift to our hobby from the distant past – in true Gem Mint condition.